This basically affects Berkswell and Balsall Common, but may be of interest to residents of Burton Green. Solihull MBC needs to find land for between 4000 and 8000 housing units over the next twenty years. Recently developers and landowners were asked to put forward sites for potential development. Over 40 sites were identified in Balsall and Berkswell parishes. Most of these are situated in and around Balsall Common. The map below shows most of the sites being considered across the two parishes. Solihull must now give consideration to the viability of these sites for possible inclusion in Solihull’s Local Plan. This will determine potentially how many houses can be built in the two parishes. The Balsall and Berkswell Neighbourhood Development Plan Committee has a responsibility to consult widely with the community about all matters pertaining to housing development. To this end we are holding a site exhibition at St Peters Hall on Saturday, August 20th from 10 a.m. This Site Exhibition, arranged by the Neighbourhood Development Plan committee, will be attended by developers and landowners. This is your chance to have your say on how sites should be chosen in our area. Please do come along! We normally have a daily visit from a black cat,who seems to be more or less wild / very timid. He had not been around for about two weeks, and yesterday he turned up very thin, with injuries under his chin. 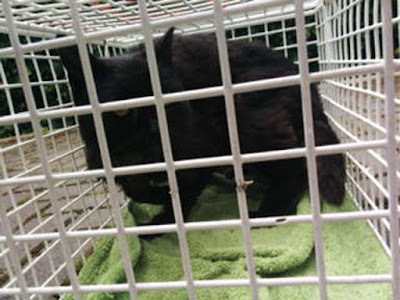 I got him trapped in the shed (as per RSPCA instructions), and the RSPCA collected him this morning, and have taken him to their vet to treat his injuries. In their check, they discovered he has a microchip, and while they cannot release the address or name of the owner, they could say that the owner resides in Burton Green, and from the work contact details, appears to be on holiday at present. 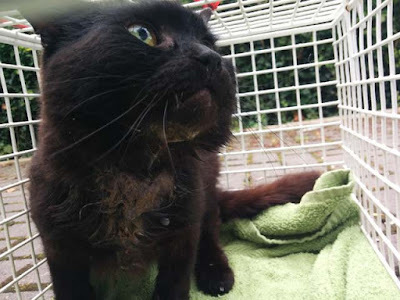 They are trying to get hold of the owners through the microchip company to get authorisation for treatment, and after discussing it with the RSPCA representative, we thought we may be able to track the owners through Burton Green Parish Council. He is black, with yellow/ green eyes. He has slightly longer than short haired fur, and may have a white patch of fur on his lower jaw, at present the fur there is completely missing, but there's a white patch of skin. He is thin and badly neglected, with ticks, but this may just be because of his injuries. He did not bite when we put him in the carrier. Was quite good about the whole ordeal. And he does know how to use a litter box. Does anyone know who this poor boy belongs to so that the vets can provide the care needed? The cat is at the Birmingham RSPCA vet.